Roll up your sleeves and get your aprons on! 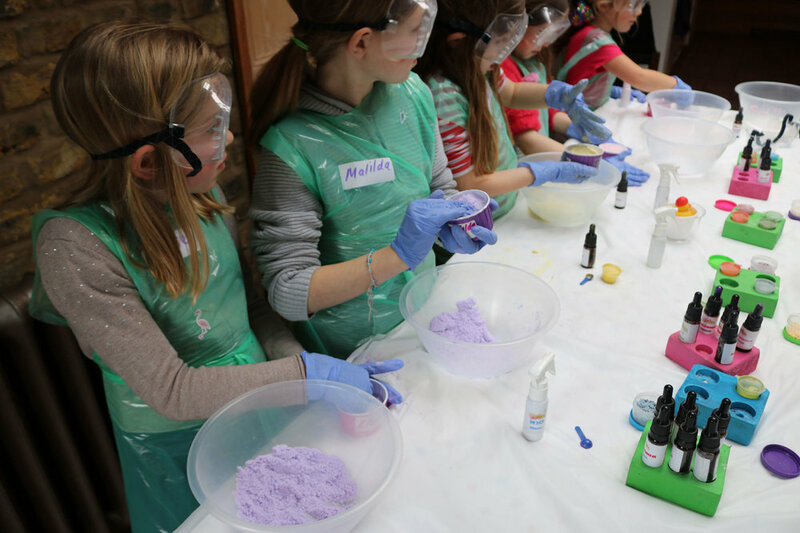 This fun packed creative soap making party allows children to learn and discover the amazing craft of soap making. Your child and their party guests will have so much fun mixing, colouring and adding fragrances to their soap and bath sherbet. Not to mention customising their very own party bag. Once we start, each party guest will get their creative juices flowing by touching, feeling, and looking at soap similar to what they’ll be making. Next, children are introduced to tools and materials and shown step by step the process and techniques of soap making. Every guest gets to choose from a large selection of cosmetic fragrance oils and natural mica colours to scent their soap, and also have the option to embed their soap with a bath toy. Equipped with the know-how children begin making their organic soap with our staff overseeing the process and offering help to those that need it. During the party, children have fun learning how to make bath sherbet, which they will colour, scent and package into a beautiful acetate container ready to take home. Lastly, guests will decorate their own personalised cotton party bag using fabric marker pens and stencils, this activity is always a crowd pleaser, as it lets every person create a beautiful cotton take home party bag which they can use over and over again. At the end, All guests are given a certificate of achievement for amazing effort and a new learnt skill. As well as all the items they have created.